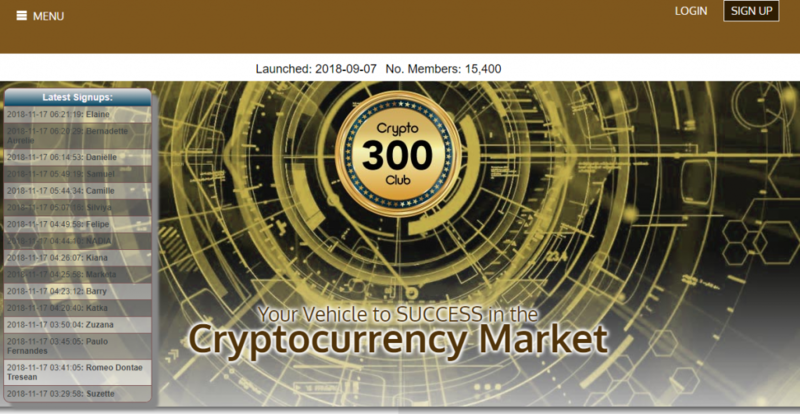 Crypto 300 Club Review: How legit is this crypto trading solution? Crypto300 Club is supposedly an online crypto trading solution platform. According to the information on the web page, Crypto 300club is the top online crypto trading club whose expert traders use pooled revenue to earn investors daily profits. What this means is that Crypto 300 Club represents an ICO. They raise money from a pool of investors to trade the crypto assets. Joining Crypto 300 Club is free of charge. Free affiliates are eligible to earnings from referrals alone. To earn the daily returns, members must invest the aforementioned $10.Their platform is user-friendly and straightforward in approach. Though they claim to generate revenue of up to 300% annually, crypto300club.com does not offer any products and services. Only affiliates can recruit new members to the referral program. The answer is blatant NO. The returns offered by this website are 2% daily for 60 days and then 1% for life, which 1% daily sums 365% a year. This number is not sustainable regardless of what strategy you follow. This type of returns is not only unrealistic but also fictitious like a Ponzi scheme. Below are reasons why it is risky to invest in Crypto 300 club. Crypto 300 club is not licensed with the Financial Conduct Authority, thus it is unregulated and operating illegally. Lack of transparency. This is one of the major reasons why Crypto300club.com is risky. They don’t disclose any trading history, no information on the web page on their technical aspects of trading and the strategies they intend to follow. There are no information regarding the fund managers. They do not offer demo accounts. Almost all of the reputable solution feature free trial or demo accounts to showcase their level of commitment and effectiveness. The testimonials about them online are too flattery and could be nothing but a structured pitch to trap newbie investors. In this era of multiple online scams, before you trade any asset it is advisable make some researches about the true nature of the investment you are planning to dive into. Crypto 300 Club offers shortcut to procuring wealth without feeding the public with enough information it is. Stay away from Crypto 300 club, it might be a scam.